Hungary i/ˈhʌŋɡəri/ (Hungarian: Magyarország [ˈmɒɟɒrorsaːɡ]) is a landlocked country in Central Europe. It is situated in theCarpathian Basin and is bordered by Slovakia to the north, Ukraine and Romania to the east, Serbia and Croatia to the south, Slovenia to the southwest and Austria to the west. The capital and largest city is Budapest. Hungary is a member of the European Union, NATO, theOECD, the Visegrád Group, and is a Schengen state. The official language is Hungarian, also known as Magyar, which is part of the Finno-Ugric group and is the most widely spoken non-Indo-European language in Europe. Following a Celtic (after c. 450 BC) and a Roman (AD 9 – c. 430) period, the foundation of Hungary was laid in the late 9th century by theHungarian ruler Árpád, whose great-grandson Saint Stephen I was crowned with a crown sent by the pope from Rome in 1000 AD. TheKingdom of Hungary lasted for 946 years, and at various points was regarded as one of the cultural centres of the Western world. After about 150 years of partial Ottoman occupation (1541–1699), Hungary was integrated into the Habsburg Monarchy, and later constituted half of the Austro-Hungarian dual monarchy (1867–1918). 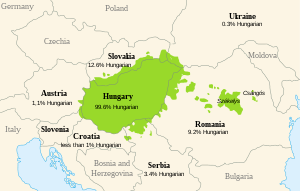 A great power until the end of World War I, Hungary lost over 70 percent of its territory, along with one third of its ethnic population, and all its sea ports under the Treaty of Trianon, the terms of which have been considered excessively harsh by many in Hungary. The kingdom was succeeded by a Fascist regime, and then a Communist era (1947–1989) during which Hungary gained widespread international attention during the Revolution of 1956 and the seminal opening of its border with Austria in 1989, thus accelerating thecollapse of the Eastern Bloc. The present form of government is a parliamentary republic, which was established in 1989. Today, Hungary is a high-income economy and a regional leader in some respects. Hungary is one of the thirty most popular tourist destinations of the world, attracting 8.6 million tourists a year (2007). The country is home to the largest thermal water cave system and the second largest thermal lake in the world (Lake Hévíz), the largest lake in Central Europe (Lake Balaton), and the largest natural grasslands in Europe (Hortobágy). Hungary has undergone major macroeconomic and structural adjustment in its transition to a market economy. Under extremely difficult economic and social circumstances, notably the collapse of trade with the former east-block countries and the consequent initial job losses, the Government has largely resisted protectionist pressures – even in the face of large twin fiscal and trade deficits in 1995 and high levels of government (internal and external) debt. Instead, Hungary has pursued new trade opportunities, especially with the European Union, the European Free Trade Association (EFTA) and partners in the Central European Free Trade Agreement (CEFTA). A new WTO Secretariat report on Hungary’s trade and investment policies states that Hungary’s preparations for accession to the EU will lead to more structural and institutional adjustment. Some of the reforms, particularly in the areas of intellectual property rights and competition policy, go beyond Hungary’s WTO obligations.